On Saturday, March 25th, we held our annual Spring kickoff Bike Blessing. The blessing was led by Pastor Mychal Spence. A special thanks to Pastor Mychal Spence and his wife Donna for doing the blessing. And another special thanks to all of you who joined us! It was a great day for the blessing. 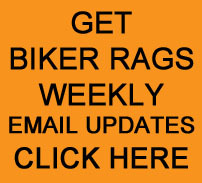 Always glad to have you at Biker Rags! Let’s get the blessing started. Everyone really enjoyed Pastor Mychal’s words. A great day to socialize. Thanks again Pastor Mychal and Donna!! After the blessing, everyone stayed for FREE pizza! YUM! You can view all of our specialty posts on our “ARCHIVES PAGE” by CLICKING HERE. This entry was posted in Annual Bike Blessing and tagged Annual Bike Blessing, Biker Rags. Bookmark the permalink.